2 What about Climate Change? 5 Response to the Bushfires. I welcome the opportunity to provide a submission to this 2009 Victorian Bushfires Royal Commission. The tragic events associated with the 2009 Victorian bushfires on and around Black Saturday on 7 February 2009 are without parallel in my lifetime. These fires have directly affected many friends and their families, including some who lost family members. All measures that are feasible and effective in reducing the impact of such fires must be carefully considered and implemented to avoid a similar loss of life in the future. Previous CSIRO warnings of more frequent and serious fire events such as those experienced in February 2009 have unfortunately been realised. I write this submission as an individual, not as a representative of any group or organisation. In this submission, I look at some of the broad issues that I feel contributed to the bushfires, and then provide some specific recommendations relevant to the Commissions’ terms of reference. According to the most recent science described in the Climate Code Red report (2008), we are already, with the current level of greenhouse gases in the atmosphere and our current rate of emissions, locked in to a warming of 2 degrees by 2030. Global temperatures have increased already by 0.8 degrees. While 1 to 2 degrees of temperature rise appears to some to be of little consequence, scientists have clearly stated that this would result in extreme variations in weather such as those encountered on both Black Saturday (when Victoria recorded its hottest ever temperature) and the preceding week (when 3 days with temperatures exceeding 40 degrees occurred). The combination of ongoing low rainfall and three consecutive extremely hot days resulted in the drying out of vegetation in plantations, farmland, forests and even suburban Melbourne to tinder-like conditions. Many plants, including trees, had dropped a lot their foliage due to heat stress following the three very hot days. Many had also died. This occurred in both urban and rural areas. I photographed large quantities of leaves from Plain Trees in suburban Surrey Hills on Saturday 7 February, which gave the appearance that autumn had arrived early. On Black Saturday, temperatures in excess of 46 degrees combined with very strong north westerly winds, followed by a strong south westerly wind change early in the evening, resulted in the highest ever Fire Index ratings recorded in Victoria. Once the fires were going, they consumed all in their path, including farmland, plantations, forests and tragically, houses and other buildings. Fire experts such as Kevin Tolhurst have stated categorically that the severity of the fires and the speed they travelled resulted from the extreme weather conditions on the day rather other factors such as fuel loads. Professor Karoly has also pointed out that CSIRO scientific predictions are that the current rate of climate change were are experiencing will result in 4 times as many extreme fire dangers days like Black Saturday each year by 2050. Dr Kevin Tolhurst has provided some scientific research results on the spread and intensity of fires. The scale of these fires has not been modelled to date, and factors such as extreme convection columns have not been studied or modelled to date. Many fires active on Black Saturday such as the Bunyip fire burnt large areas of farmland as well as forest areas. 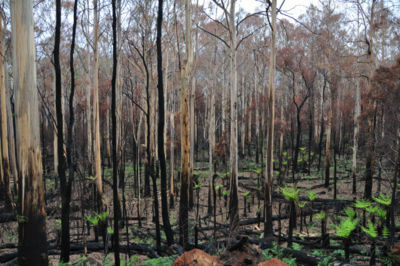 Two thirds of the Bunyip fire was cleared farmland. Some commentary in the media after the bushfires suggesting that fuel loads were the major cause of the fires, particularly in forest areas, is incorrect. Kevin Tolhurst has stated that the extreme weather dominated the fire behaviour rather than fuel loads, which played a lesser role. As an example, he has mentioned the Lara bushfire on grass paddocks on 8 January 1969 along the Geelong Road that killed 17 people trapped in their cars. In total, 280 fires broke out on the 8th of January 1969. Of these, 12 grass fires reached major proportions and burnt 250,000 hectares. The fires also destroyed 230 houses, 21 other buildings and more than 12,000 stock. For less extreme fires, fuel loads can play a greater role in contributing to the extent and heat of the fire. Around 100,000 hectares of forest has now been burnt twice in succession in 2003 and 2006/7, which has killed the large areas of Mountain Ash forest and the seed for these trees, which cannot now regenerate. So climate change is contributing to the frequency and severity of bushfires, which are now destroying wet forest that would previously have acted as a natural fire breaks. As these wetter forests are not adapted for burning, they will now largely replaced with dry sclerophyll forest, which is more prone to burning in the future. Increased fuel reduction burning, as advocated by some people, would further exacerbate this situation. It is clear that we need to make decisions about land and forest management and bushfire management based on firm scientific evidence rather than pressure from lobby groups. Make decisions about land and forest management and bushfire management, including fuel reduction burning, based on firm scientific evidence rather than pressure from lobby groups. Conduct further research into the behaviour of extreme fire events so that they can be better understood and predicted. Increase response measures across Victoria to reduce carbon emissions as part of the global response to address climate change. While general warnings were issued prior to February 7th, some people who did not watch television or read newspapers were not aware of them. There were no mechanisms in place for issuing emergency warnings to the general public on the day of the worst fires other than broadcasts on 774 ABC AM radio. The 000 emergency service has experienced some difficulties in the recent past dealing with rural and remote area incidents, including one when an injured rock climber at Mount Arapiles had a lengthy wait for an ambulance when it was dispatched by the 000 service to the Organ Pipes National Park rather than his location. I am a member and organiser with Bush Search and Rescue Victoria. We maintain a voluntary SMS alert service for our searchers (approximately 300 in number), which is used regularly to provide messages on search callouts, initiated by Police Search and Rescue. Many people poorly understood the established policy of “stay and defend your house or leave early”. These fires were so severe that defending dwellings, even those well prepared, was impossible, as evidenced by the extremely high number of fatalities in dwellings. 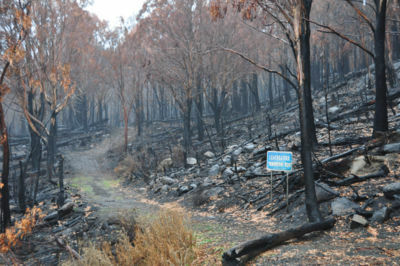 In addition, the townships of Marysville, Kinglake, Strathewen, Steels Creek, Wandong and Flowerdale appeared to have received little or no warning of an impending severe fire event, so people did not attempt to leave until it was to late to do so safely, as evidenced by the high number of fatalities in vehicles on and near roads affected by the fires. One family friend in Gippsland has also stated that they did not have a fire plan. Living in rural Central Gippsland near Poowong, many locals there did not consider they would ever be confronted by an extreme fire event. The vast majority of houses in suburban Melbourne would not have had a fire plan either, a most Melbourne residents did not believe they were subject to an extreme fire event risk. However, there was a precedent in the fairly large suburban areas of Canberra that were burnt in bushfires in 2003. There was also no clear and effective communication channel or procedure in place for warning all people of the severe fire event. Mobile and landline phone the fires disrupted services and 774 radio did not provide accurate or timely warning information to many listeners (through no fault of the radio announcers or program staff). Country Fire Authority and DSE websites were also very heavily visited during the fires, and did not appear to have sufficient resources handle the load and site traffic. Very few or no fire refuges were available in most of the regions affected by the fires. It appears that inadequate risk management practices were in place, or that risk mitigation measures (if identified) were not acted upon. Considerable fuel reduction burning was conducted in the forests surrounding Marysville by DSE over the last decade or more. 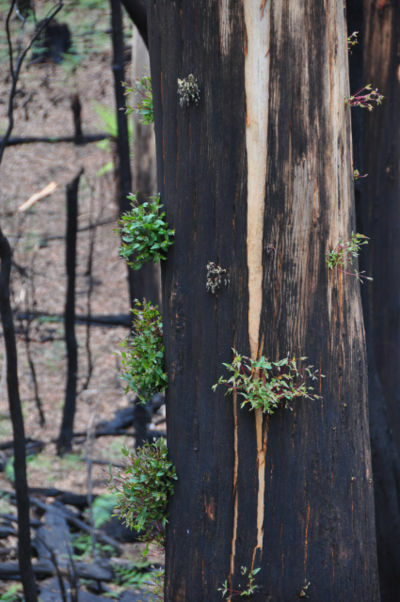 In addition, much of these and other Central Highlands forests are subject to a “logging management regime” that some claim reduces fire risk and severity. There appears to be no correlation between these claims and the areas burnt by the fires and the speed at which the fires travelled. Provide upgraded and specific mechanisms and procedures for issuing emergency warnings on extreme fire events via the AM and FM radio networks. This could include the provision of special dedicated warning radio receivers that can be remotely activated and/or overridden when required. Conduct thorough and appropriate risk management for extreme fire events and ensure that risk mitigation measures are actioned. Upgrade 000 emergency service technology platform and staff so that it has capacity to handle communications for extreme fire events. Upgrade 000 emergency service staff training and information resources so that remote and rural area events and locations are appropriately identified and managed. Provide an “opt in” service for mobile and fixed landline telephones for people that wish to subscribe to emergency notifications. Revise the “stay and defend your house or leave early” to remove the “stay and defend” option during extreme fire events. Conduct an audit of all rural and urban properties to assess how many have fire plans, and set a target for every household in the Victoria to develop a fire plan. Establish regulations for fireproof bunkers under or near houses and classify them as structural items under the building code. Provide larger community fireproof buildings in towns and schools judged to have moderate to high bushfire risk. Specify fire-retardant plants for locations near buildings. Clear vegetation from the close proximity of buildings. I listened to 774 ABC AM radio nearly all of Black Saturday. It was clear during the day that updates provided to and read by 774 were often comparatively “old” and did not provide an accurate status of the fire’s movements and which districts were under threat. Establishing an appropriate central emergency control facility with appropriate communications to all parties involved in response to the bushfires appears to have been problematic. Reliance was placed on the 000 emergency service for obtaining information about the fires, but it was not able to keep up with the call volumes or appropriately assess and/or relay all the incoming information. With the location of the start of the Maryville (Murrindindi Mill) fire and Kinglake (Kilmore) fires being known early on Saturday afternoon, the potential reach and speed of these fires could have been estimated rapidly. Apparently this did occur (by Kevin Tolhurst) yet much of this information was not relayed to emergency services (CFA, Police, MFB, SES, DSE) in the field, which hampered the ability for warnings to be issued and for resources to be appropriately deployed. The hub and spoke radio communication systems used by all the emergency services groups in the field, with mobile units talking back to and receiving instructions from a central operator, could not cope with the volume of information travelling in both directions. Consequently, much of the field information that could have been provided back to the emergency command/control centre(s) was lost. This in turn would have impacted decision-making at the command/control centre(s) and the quality of information they were sending out to field units. There is anecdotal evidenced that the CFA pager system was overloaded on Saturday 7th February too. SMS warning messages were successfully sent to nearly all mobile telephone subscribers across Victoria on 3rd March. It was clear that the path of the fires was leading to very heavily populated areas closer to Melbourne such as Greensborough, Eltham, Yarra Glen and Warrandyte. As there was no effective means of stopping the fires at their most extreme, the destruction of large tracts of both outer green belt suburbs and suburban Melbourne was possible. The south westerly wind change at around 6:30pm on Saturday 7th February appears to be the major factor that averted this scenario, although it had the affect of changing the previous “fire edge” to a new and very extensive “fire front” which then burnt Kinglake and Flowerdale. Establish a common central emergency control facility with appropriate communications to all parties involved in response to the bushfires. Ensure all emergency services groups participate in practices for management of extreme fire events, including simulated communications load. Ensure modelling of fire intensity, rate of travel and project extent is conducted early, reviewed frequently, and is communicated to all emergency services and field personal involved. Investigate using mobile and/or satellite Internet technologies to supplement radio communication system and provide more resilience and some backup in the event that radio and telephone systems are overloaded or fail. Provide standardised and appropriate GPS units with electronic maps loaded to all field units, and provide training in their use. Formalise the use of broadcast emergency SMS messages to all mobile phones across Victoria. Future scenario planning and assessment to include the possibility of extreme fire events directly threatening suburban Melbourne. Put power transmission lines underground to reduce the risk of their destruction and/or service disruption during fire events. Put landline phone infrastructure in fire retardant enclosures and put more of the lines underground. Introduce fireproofing measures to mobile telephone network infrastructure where possible. Put local power lines underground in high fire risk areas. Steel doorframes are steel and balcony. Assess measures to improve building standards for houses in areas of medium to high bushfire risk. The loss of life and property associate with the 2007 Victorian bushfires is clearly unacceptable and the long term costs and impacts to the community very considerable. While many of the recommendations I have made in this submission would be expensive to implement, I believe that they would work toward the minimisation of the impact of future extreme fire events similar to those experienced in February and March 2007. It is incumbent on the government and people of Victoria to put considerable effort and funds towards the prevention of serious impacts of extreme fire events that are correlated with extreme weather events. It is also apparent that the underlying causal factors of these extreme weather and fire events need to be addressed too. Specifically, reducing carbon emissions by any and all means possible is a key contribution that can be made towards reducing (but not eliminating) the risk of such events occurring in the future. It is important that effective evidence-based measures be implemented for improving the preparation and planning for future bushfire threats and risks, particularly the prevention of loss of life. There are considerable opportunities to improve the emergency response to fires and public communication and community advice systems and strategies. This page was last modified 13:46, 22 June 2009.